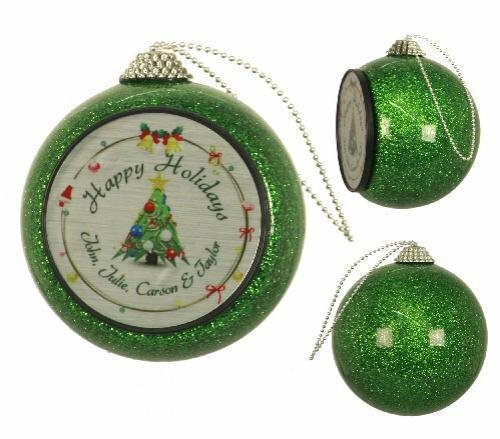 Put a little sparkle in the holidays with this green glittered ornament. The flat area on the front of the ornament accepts a 2" disc personalized with your photo, message or Holiday greeting. Made of durable impact resistant plastic, and with an attached beaded string for hanging, it will make a wonderful gift or promotional item that will last over the years. An ornament is the quintessential gift for the holiday season. Whether personalized with a meaningful message for a loved one, or personalized with a company logo for holiday corporate gifts, they are a charming addition to anyone's tree. This unique Round Christmas ornament has a matte maple veneer wood grain finish, and comes with a red satin ribbon for hanging. Personalize it with a photograph, your business, team, school, or other organization’s logo to create a fun promotional item, personalized gift, or memento of a special event or occasion. This unique Benelux Christmas ornament has a matte maple veneer wood grain finish, and comes with a red satin ribbon for hanging. Personalize it with a photograph or your business, team, school, or other organization’s logo to create a fun promotional item, personalized gift, or memento of a special event, occasion. or milestone. gift, these ornaments are sure to be treasured for years to come. This 3-3/4" doily ceramic ornament can be personalized on both sides with your graphic, photo or other memento. This charming ornament makes a unique personalized gift, or attach the included gold string and hang it on your own tree to enjoy year after year. 3" x 2 1/8" x 1/4"
This 2-1/2" round ceramic ornament can be personalized on both sides with your graphic, photo or other memento. This charming ornament makes a unique personalized gift, or attach the included gold string and hang it on your own tree to enjoy year after year.